Here is a translation of chapter 11 of "Zettai Heiwa Daisakusen"
It looks like Aerandria is currently working on chp 9, so I will not go back and do scanlation for that and the preceding chapters. If Aerandria catches up with me, then I will not longer scanlate this series. Yay!!! My job may be done here :). Anyhow, this is another very cute chapter. We learn a little bit about Canaan's past and the disposition of Yuda's mother. As usual, this translation is by no means perfect, and if you find any errors, please send me a kind little e-mail detailing the error. Please do not upload this file to any of the manga aggregators because I will do it myself. You may, however, share the link. I'd like to extend upon a blog entry I did on manga translation way back in Nov of 2007. What’s interesting about this is that I feel a very strong connection to the original text and to what I’ve written. I didn’t expect this. It feels sort of like I’m a part of the story creation process because much of how I feel about the story and the characters comes out in the words and the phrasing I choose to translate the words to and the way I describe the action in the pictures. I also feel that I have a greater understanding of the story because I’ve had to fully digest the Japanese words and the pictures in order to choose the proper words and phrasing. Does it matter to me whether I accurately present the mangaka’s intent? That’s a tough question to answer. I really can’t say for certain what the author intended without talking to the author. Besides, when I read a manga, all that is present goes through my filter and that shapes how I perceive the story. Therefore, when translating and then scripting, what exits my filter is what goes on the screen. I think this is very powerful and double-edged. I endeavored to learn Japanese because I didn’t like the way the professional publishers localized manga for an American audience. I sought purity and from this pure base, I wanted to be able overlay my own interpretation. Being on the other side of it as a translator, I’m am not offering purity to those that read my blog. This leaves me to ask myself, who am I to offer up my interpretation of this manga to the world? Am I providing a service or satisfying myself? I think I am doing both. Besides I know not to take myself too seriously since anybody that reads what I’ve written, will apply their own filter on top of my filter. I've had reason to think a lot about translation lately. And I think some people don't understand the difference between translation and interpretation. If I translate the Japanese in manga directly into English, I don't think it would make much sense. Japanese syntax is different and there are idioms, that if directly translated, make no sense. I also come back to the thought of a person's filter. I see through the lens of my own experiences and knowledge, so that is where I interpret from. Every person is different, so naturally, no two people would ever come up with the exact same translation for a very long piece of work. But this is where interpretation comes in. Sure I can understand the Japanese, but getting the Japanese into English is something entirely different. Compared to English, Japanese is a very compressed language that has subtleties linked to culture. In essence, one Japanses word or phrase may unravel into a very long concept in English. And when I say "concept," I mean the translation unravels into something that's not concrete in English -- in other words, there is no 1-to-1 translation in English. This is why I take issue with "100% translation," because there is no such thing. Going back a little, I think I understand now why I took Japanese. It was to understand all that stuff that couldn't be expressed in English. For me, the actual Japanese of many manga is very beautiful and intensely descriptive in terms of the emotion and the relationship between characters. In many ways, I wish I could do a direct brain transfer so everyone could have the same joyful experience with the text as I do. As for a "truer translation," I can do a translation in which I go between a Japanese-to-English dictionary, plugging words in. This, though, doesn't get at the underlying meaning that is trying to be conveyed through the words because the context has not been taken into consideration. It is important how the sentence is constructed and what the relationship is between characters to understand the full meaning of what is said in Japanese. Context also comes from personal experience and knowledge of culture and life in general. This is what I strive for when I scanlate. I am not interested in a 100% perfect translation. Rather, what I'm interested in is conveying the story and the relationships between the characters as I've interpreted from the Japanese. Again, I can't say whether this is the author's intent. Nobody can say the author's intent other than the author -- hence, this is why we have discussions about texts. Now, what to make of the different translations you may see of various anime and manga series? Well, I'll say this: go with the interpretation you like best. As for my work on Ouran and ZHD, well, I admit to a mistake or two on the small things, but for the most part, I am quite confident that I've properly conveyed the stories as I've interpreted from the Japanese. As for the differences you may see, well, I've done comparisons with the different version and the raws ... and I'm sticking with my translation and my interpretation. Like I said before, there's no such thing as a 100% perfect translation and I know, for sure, that's nobody's perfect, nor am I arrogant enough to proclaim my translation is anywhere near perfect or better than anyone else's. I do, though, want to say, in conclusion, I love the series I scanlate and love sharing my translations and interpretations with my blog readers. ZHD Chp 8 Scanlation is out from Aerandria. It can be found at in the usual places. I will get back to ZHD chp 11 after I finish Ouran. It looks like Aerandria is picking up the pace, which means I don't have to translate this any further after chp 11. Yippee!! I can move onto translating a different manga. 7/27: I finished translating the chapter. I found some translation errors in the stuff I've already translated, which I'm now in the process of correcting :) (Don't worry the corrections don't impact the story). Yay! I'm learning! Anyway, if all goes well, I will post the entire chapter tomorrow. Spoiler: The pesky one isn't Tamaki's grandmother, as we all expected, rather it's Tamaki's father (it seems that he is the true head of the family whether the grandmother accepts it or not) ... though, I imagine in the chapters coming Tamaki's grandmother is going to be a tough nut to crack. Knowing that Tamaki's father is behind this all, makes me feel that nothing bad will happen to Tamaki or Haruhi or Tamaki x Haruhi. Tamaki just has to go through some trials to win over his grandmother. Then it's a matter of him and Haruhi getting their act together. Note: I took a little creative liberty with the term "Bump into Kiss" because the Japanese has it written in some messed up English as "Happening Kiss." That makes no sense so I went with another phrase. I was debating whether to call it a "Meet Cute," but then decided that "Bump into Kiss" was more fitting. As always, if any of you catch a translation error, please be so kind as to send me a kind e-mail and I'll fix it right away. I updated the file to include everything I've translated so far. Again, remember, this is about an 80% translation, but hopefully, I've managed to capture spirit of things so we all can know what's going on with story in real-time until Viz publishes the English version. Also, I believe this is good practice, so hopefully, my translations will improve as I continue to grind away. Blackbird volume 1 is going to be released on August 4th in the US. Yeah!!! It's a really good manga, but it's a bit "over-the-top" so I was a little afraid to share any translation of it. Volume 2 is scheduled to release in November. Hopefully, they'll be able to keep going at a 3-month clip, so there won't be a strong outcry for fan translation. Showgate Going After People for Sharing "Canaan"
Showgate is sending nasty-grams to individual who are downloading the series "Canaan" via BitTorrent. I have no clue how to watch the show otherwise and it seems that Showgate doesn't mind leaving money on the table by not serving its potential audience. Anyhow, I hope they get a clue soon and work with some of the fansub groups to get series out to the US simultaneously with Japan so we all can have a legal win-win-win situation (like Crunchyroll). As for "Canaan", I guess I'll skip it since I can only watch up to episode 3. Since I won't have any clue as to what this show is about, I imagine Showgate will not be seeing any money from me via purchase or rental, because by the time it comes out in the US (along with some terrible English voice acting), I will have forgotten about the series. I since I will not see the series, I will not be blogging about it and spreading the positive word to my many 1000's of readers about this series. This is what happens when companies unleash "hate" upon current and potential customers and influencers. This is also what happens to companies that do not know how to work the Internet. I really hate to see Showgate leave so much money on the table due to their own ignorance and arrogance. It's definitely not the way to run a business. If you want to beat piracy you have to join them and then offer a better experience to customers. Threatening potential customers only leads to backlash. Here's "Zettai Heiwa Daisakusen" Chapter 10. After I scanlate Chapter 11, I will go back and scanlate chapers 7 - 9, unless the other scanlation group gets to it first. Please do not redistribute this scanlation. I will post it to the aggregator sites myself. As always, if you find any translation errors, please leave a comment or send my a kind e-mail. Sorry about that, from now on, I'll put the scanlations in black and white. It's a 3-click process, so it's no big deal. Again, please do not upload these to manga aggregator websites without my permission. 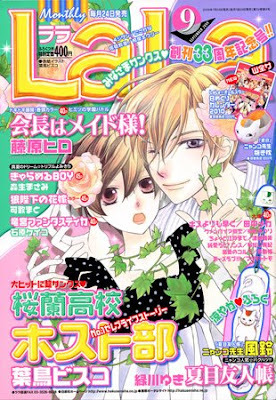 Here's my scanlation for Ouran Koukou Host Club chp 72. Again, I don't guarentee this translation is 100% so please don't get upset with me. Again, I hope I captured the spirit of the events. If you find any translations errors, as always, I ask that you leave a nice comment or send me a nice e-mail. Please do not re-distribute this, but you may link to this post.